Spice and Sass: Five on Friday- FOOD! Our baby meals are coming to an end (sob! ), and I am getting back into the kitchen. Of course, I love to cook and eat, so this is no great hardship. Of course, at 5 PM when I am trying to get something ready and both children are screaming to be held, I might say something different. . . This rich and creamy soup from this month's House Beautiful just tastes like spring. Leeks and Asparagus- what's not to love? Find the recipe here. 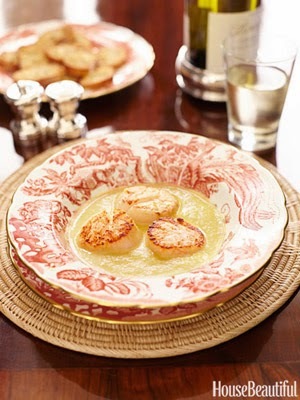 You can add scallops if you are feeling fancy. Have I told y'all that Deeds is getting baptized Easter Sunday? Probably so. My in-laws are all coming in from North Carolina and staying at my parents' house. 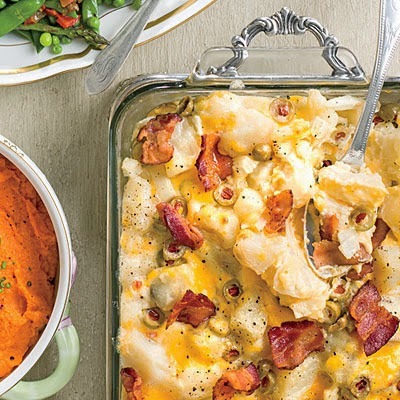 We are having Easter lunch on Saturday at my house, and I am being thoroughly unoriginal and making the Easter lunch menu from this month's Southern Living. I made a trial run of the Hot Potato Salad as I was both intrigued (green olives) and concerned (velveeta). It was delicious! Morgan also approved. 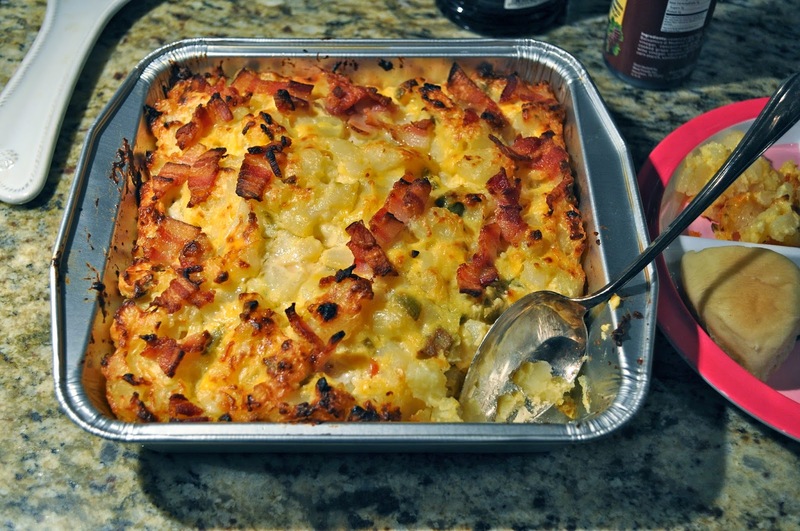 The inclusion of velveeta falls under the old recipe/cannot be subbed with actual cheese exception. I have had to make approximately eight hundred billion of these brownies for a volunteer deal this weekend. Of course I had to make a practice run for my house this week, just to test my oven of course. I'm real scientific like that. Basically you make a box of Duncan Hines chewy fudge brownie mix (fudgey style) and put in in a 13x9 pan. Then you place three Hershey's Symphony bars (with toffee and almonds) on top. Then you cover that with another box of prepared brownie batter. Bake it in a 350 oven for 30 minutes, then 325 for 10-20. Heavenly! 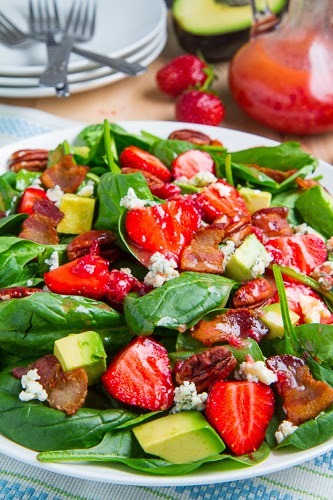 Luckily to balance out the potatoes and brownies, I have been obsessed with salad lately- salad with strawberries, avocado, pecans and goat cheese. I make a simple balsamic vinaigrette and can't get enough! Also balancing out my dietary indiscretions is a constant mug of homemade ginger tea. I love the stuff! 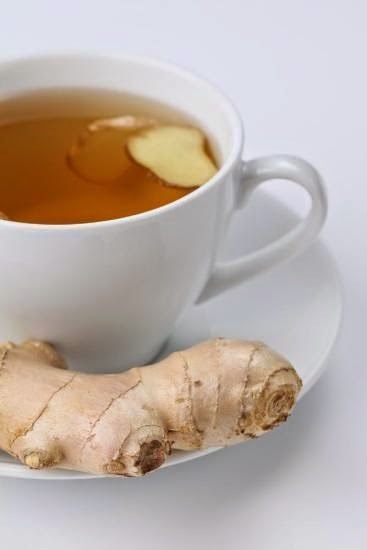 Basically you boil chopped and peeled ginger root, let it steep for about 20 minutes, then add lemon juice and honey to taste. Delicious! It helps my tummy, and possibly Deeds' tummy through my milk. Also possibly speeds up your metabolism. So that's it for me- off to sling brownies all weekend and enjoy this beautiful weather! 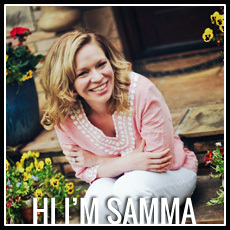 Thanks, ladies for hosting the link up! Stopping in from 5 on Friday... You are a step ahead of me Eater menu-wise, at least you have a plan and have tested one dish! I am hosting for the first time this year and I have not done anything. I need to get on that. Have a great weekend! YUM to all of this! I'm currently ignoring my work inbox and scouring the internet for recipes for the two things I bought at a farmers market this morning - sunchokes and lavender! The hot potato salad looks divine! You always have the best food ideas. SOO much wonderfulness in the post!! That soup looks amazing! Yum yum! These all sound amazing! Might have to try out that hot potato salad too ! 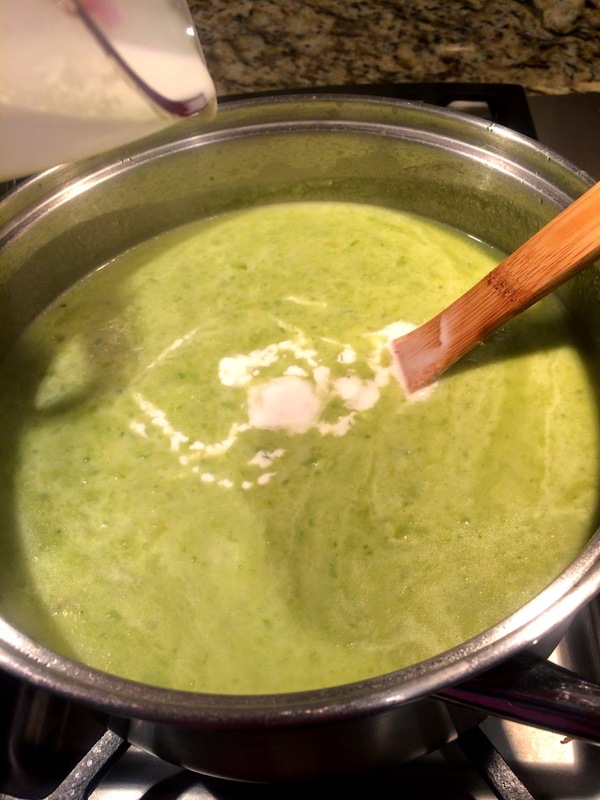 That asparagus soup looks so tasty (and I love your pretty bowls, too!). Your Easter guests are very lucky!